Description: New York, 1882. A dark, forbidding city, and no place for a girl with unexplainable powers. Like her mother's, Avery's powers refuse to be contained. When she causes a bizarre explosion at the factory, she has no choice but to run from her lies, straight into the darkest corners of the city. Avery must embrace her abilities and learn to wield their power--or join her mother in the cavernous horrors of the Tombs. And the Tombs has secrets of its own: strange experiments are being performed on 'patients'...and no one knows why. 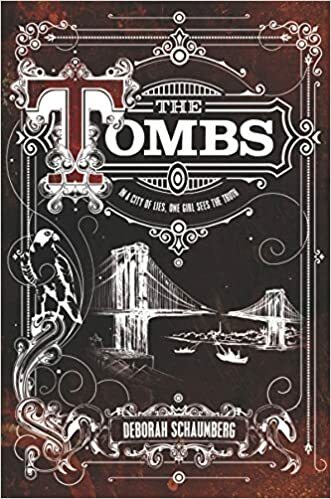 Deborah Schaumberg's gripping debut melds history and fantasy, taking readers on a breathless trip across a teeming turn-of-the-century New York, and asks the question: Where can you hide in a city that wants you buried? My Thoughts: This historical fantasy takes place in an alternate history New York in 1882. Avery Kohl is a young woman working in one of the many factories. She a welder in an iron works. She and her father are hiding from the Crows who took her mother and imprisoned her in the Tombs which is part prison and part mental asylum. Her father works as a clockmaker/inventor which brings in a steampunk element to the story. Avery is sixteen and starting to have the sort of visions that led to her mother's imprisonment. She's afraid that she is going mad. She's determined to get into the Tombs to see her mother and ask her questions. After she sees the conditions under which her mother exists and attracts the attention of the mad scientist who is experimenting on her, she becomes determined to find a way to free her mother. Meanwhile, her own paranormal ability explodes and she needs to go to the Gypsies for training in using or hiding her powers. There she finds out that a boy named Indigo that she met years ago has been taken by the Crows too. She recruits her best friend Khan - a young black man who her father rescued during the Civil War - to help her. This story is packed with history from the problem with race relations, the problem with organizing labor unions, and the role of women. It takes place in the shadow of the Brooklyn Bridge which is just being built and is a marvel of its age. It takes place in the grimy and gritty factories where children can be beaten by their supervisors. It adds in magic in Avery's power as an aura seer and a mad scientist who is making a formula to make laborers docile and obedient using the blood of seers. This is filled with action as Avery and her friends try to free her mother and elude the Crows sent by the scientist to capture her. Once captured, the conditions in the Tombs are horrible but Avery manages to make friends and design a plan to escape. The main plot point which is freeing her mother is accomplished but there are a number of dangling threads left for a sequel. I thought the story began slowly but, once I got the rhythm, it gained momentum and became a fast paced adventure. If only my mother had kept her visions to herself, the crows might not have taken her. Three years she'd been gone. My eyes burned and I felt the familiar ache inside my chest. My temples pulsed as the pain spread behind my forehead. I had to make this stop. If I go mad, who will take care of my father?